Jules Verne's adventure story about a wager to circumvent the globe in 80 days was so popular when it was first published that it spawned several real-life copycats who tried to replicate the adventures of Phileas Fogg and his valet Passepartout. Artist Aude Soleilhac's vibrant and detailed work captures the numerous people and places encountered in Verne's epic tale, which still manages to elicit wonder and excitement in readers more than 125 years after it was first published. Loic Dauvillier was born in Cambrai, France in 1971. In 1996, he helped to found Editions Charette where he worked with Jean-Luc Loyer. 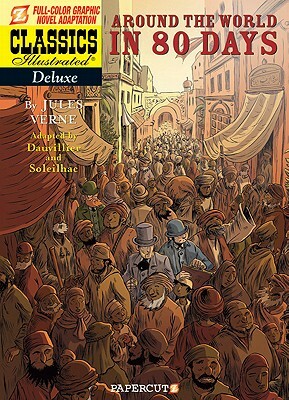 In 2004, Dauvillier began work for Editions Delcourt with his adaptation of "Oliver Twist," after which CLASSICS ILLUSTRATED DELUXE writer Jean David Morvan ("The Adventures of Tom Sawyer") hired him to adapt "Around the World in 80 Days." Aude Soleilhac is an artist whose work includes "Marine and Cornelius," a graphic novel adaptation of "Tristan and Isolde," and the comic strip "Vil City." Soleilhac also draws for the studio "Cutts."